Where do goals originate in an organization? Is the goal-setting process top-down or bottom-up? Should goals be mathematical subsets of supervisor’s goals? I was lucky enough to coach a C-level executive at a Fortune 500 company who told me that Objectives and Key Results (OKRs) were a complete failure when they were only top-down, but successful when they were developed mostly bottom-up. Instead of executives getting managers to buy-in, managers were told to define their goals with only a high-level set of corporate goals as inspiration. These managers turned into leaders and started the very conversations the executives wanted to have. OKRs is my favorite goal-setting model. It proposes that most goals originate bottom-up. John Doerr, a prominent venture capitalist who often talks about OKRs, once advocated 60% of Key Results be developed bottom-up. The essence of Doerr’s comment is that most goals should originate with the goal-owner rather than from a corporate mandate as this creates ownership and accountability. In my experience, purely top-down goal-setting systems fail 100% of the time. The top-down systems fail because they send the message that team leaders and individual contributors must follow corporate mandate. Many employees will not be engaged at work if they’re simply taking orders. It reminds me of being a kid when I was told to do my homework. Being told to do something just isn’t very inspirational. If bottom-up wins, what is the role of cascading goals? If the OKRs model emphasizes bottom-up, how are goals cascaded? In Doerr’s famous Football Example OKRs originate at the top and are cascaded down into the organization and are tightly coupled. That is, the company Key Result to “fill the stands to 88%” simply becomes the Objective for one of the CEO’s direct reports. So, tightly coupled could be interpreted as requiring your supervisor’s Key Result be equivalent to your Objective. I get calls from prospective creators of OKRs software tools telling me all about how great an OKRs tool would be if it followed cascading logic implied in the Football Example. Each OKR could be directly linked with a mathematical relationship to higher-level OKRs. However, this mathematical cascading goal system is not the intention of OKRs at all. In fact, earlier this year, Doerr made this clear by noting, “OKRs need not be hierarchically coupled.” After all, Google does not have such a tightly coupled system. Google’s leaders, Larry and Sergey, define the company OKRs, which inspires other teams to create their OKRs. The purpose is for the company OKRs to roughly inform other OKRs. Although the company-level OKRs are declared first, there is no formal cascading process requiring every OKR to be specifically linked to another. The OKRs process balanced the concept of top-down and bottom-up. It is a top-down process in that the company OKRs are declared first and set the stage for the creation of OKRs at lower levels of the organization. It is a bottom-up process in that the team leaders and individuals create their OKRs and propose them to their supervisors using the company OKRs as context and inspiration. In my most recent OKRs engagement, the CIO had me draft OKRs with his five direct reports. During our 1:1 OKRs coaching sessions, the direct reports created a proposed set of OKRs, I facilitated five more 1:2 sessions with the CIO and each of his direct reports. When I debriefed with the CIO, who had long histories with each of his direct reports, he told me our OKRs exercise was the most revealing and insightful management exercise he’s ever experienced. For the first time in nearly 20 years, he felt as if he clearly understood what each of his direct reports felt was most important. By taking the time to define clear Objectives and measurable Key Results, the conversation was not subject to interpretation. 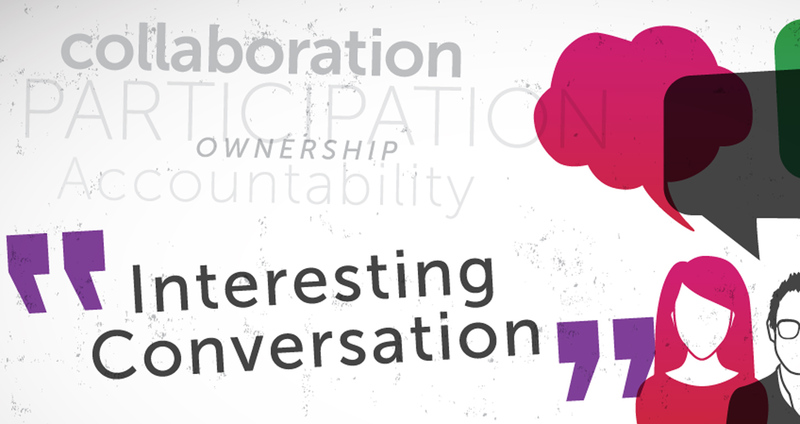 Each of the 1:2 sessions led to unexpected, interesting and important conversations. While it’s not fair to end this post by singing, “It’s all about that bottom-up, bout that bottom-up, no cascade,” I do believe that originating most goals bottom-up will lead to much more collaboration, participation, ownership, accountability and interesting conversations than an approach emphasizing top-down goal cascading. Objectives and Key Results is one goal-setting framework that suggests most goals originate bottom-up.